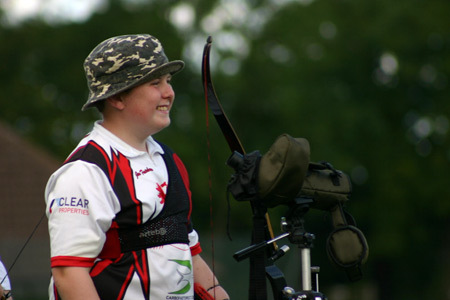 I live on the outskirts of Leeds, West Yorkshire, England and I have been taking part in compe­titive archery since the age of 6. My club is PANDA Bowmen and I am currently on the Archery GB Academy Programme. I am very excited at the prospect of developing my archery, and through hard work I intend to represent Great Britain in the future at both target and field archery. In 2014 I won 6 National titles and broke 12 National records and finished No.1 in the UK Junior Target rankings for my age. Wherever I shoot I always remember that I am not just shooting for myself, but also representing my club, county and sponsors. The bow style I now shoot is Olympic recurve, although I have also shot Barebow & more traditional styles. In 2009 I entered my first national championships and came runner up. The following year I became the under 9 National Target Archery Champion at both metric and imperial distances. Since then I have won many competitions at both county, regional and national levels. In total I have won 20 National Titles and broken a similar number of National records. In addition to target archery I also take part in field archery and have won national titles in both GNAS (World Archery) and 3D Field Archery. I am also a member of the English Field Archery Association with is affiliated to the IFAA. I would like to thank Nadja and Artebo for their continued support and I can honestly say that their chest guards are the most comfortable I have ever used.